Unlike native safe removal tool's menu it shows you device drive sizes and empty space, device icons, lets you customize anything, and gives much more abilities at your fingertips: you can stop or browse drives in a click, quickly launch portable applications, speed test your drives, scan for hardware changes, stop all devices at once and many more. Not only does Zentimo allow you to stop such devices, it also detects automatically what devices must be "safely removed" and which devices must be "disabled." Also, the program enables the "disabled" device automatically on its next connection, thus it makes working with the device absolutely the same as with a usual device. Like to do everything using the keyboard? Now you can stop and view devices with only ONE hotkey! No need to remember keyboard shortcuts for each device. Being in any application, press the key combination (Win+S by default) and you will see the stop menu. Use the Up\Down Arrow keys to select the device you need and either press Enter to stop it or Ctrl B to view the contents of a device disk. Also you can assign a dedicated hotkey to stop a certain device or even all devices at once. Ever encountered the situation when Windows does not allow you to remove a device? Unlike Windows, Zentimo will show you the programs which prevent the device from being stopped and let you close these programs or just the files they opened on the device. 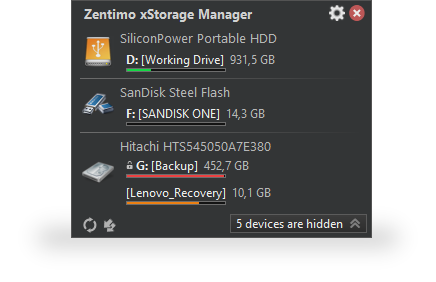 Even if there are opened programs on the device Zentimo can still forcedly stop the device by wisely unlocking file processes and by unloading the programs launched from the drive. If you had safely removed a card reader, you would need to physically reconnect it in order to make it work with cards again (or to use "Return device back" feature of the program). 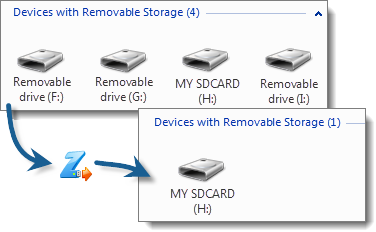 In the case of two or more memory cards connected to the card reader at the same time, they all become unavailable in the system after you stop the card reader. Zentimo lets you eject memory cards one-by-one. Moreover, if the memory card was locked by any processes, the program would display these "locking" processes as well as it does on failure to stop a whole device. Zentimo supports all kinds of hotplug devices. 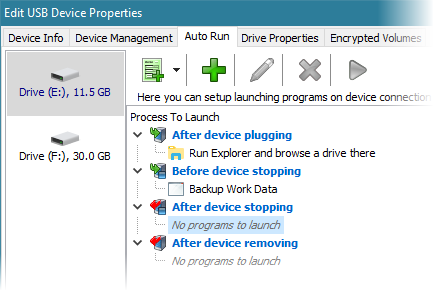 If it does not display the device you need, try enabling the "Display all storage devices" checkbox in the program options. 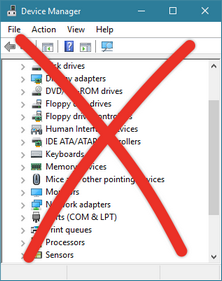 If you wish to power off your drives after their stopping go to the Program Options and enable the “Power off the device after the device stopping” option. Another Zentimo's feature that distinguishes it from similar software is ability to start any applications not only after connecting a device, but also before its removal. 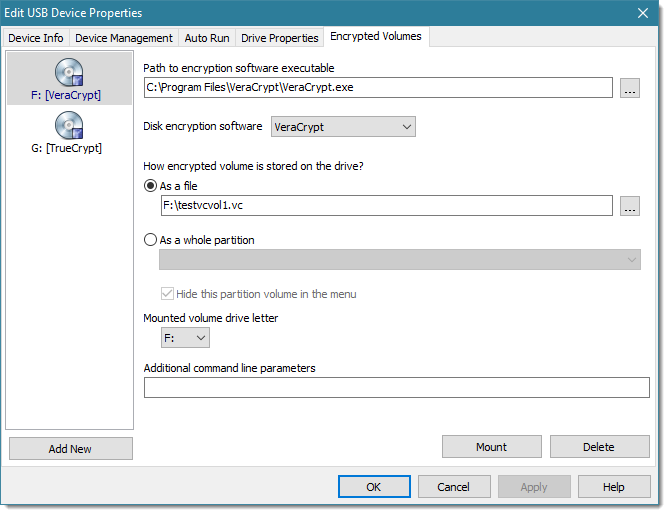 The autorun feature allows you to set up data backup before disconnecting a removable hard drive, run Total Commander with the contents of the pen-drive, automatically unmount an encrypted TrueCrypt drive before disconnecting the USB media, etc. Zentimo has a powerful and convenient command line: usr.exe. It allows you to automate work with devices. For example, you can automatically stop devices according to schedule or in case of any other event or reactivate them back to the system. Do you have a card reader with several slots? If you said "yes", you would likely use only one memory card at a time, however your card reader creates up to four drives in your system. It may be annoying because you are required to spend more time finding the memory card drive among other "empty" card reader drives. 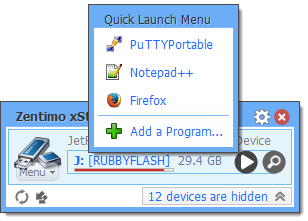 Zentimo rids you of this problem - the program can hide "empty" card reader drives automatically! 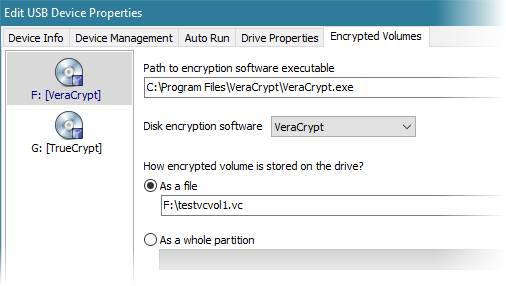 The program have deep integration with encryption software such as TrueCrypt, VeraCrypt and CipherShed. 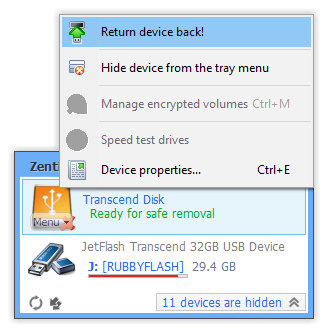 Your encrypted containers that are stored on external drives can be handled like a part of the device: you can see them on the device menu, they can be automatically mounted\dismounted on device connection\disconnection and even if a program prevents encrypted volume from being stopped Zentimo allows you to see and unlock such programs. 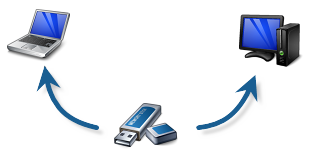 Our investigations shows that some flash drives have worse performance than other ones on writing of small files however their top performance at writing large files are the same. Therefore we added to Zentimo a performance measurement tool that allows to display you real performance of your drive.